Sol. Society for Worldwide Inter bank Financial Telecommunication (SWIFT) code . An internationally-recognized identification code for banks around the world. SWIFT codes are most commonly used for international wire transfers and are comprised of 8 or 11 alphanumeric characters. Q2. Which of the following is not a ‘Money Market Instrument’? Sol. There are several money market instruments, including treasury bills, commercial paper, bankers’ acceptances, deposits, certificates of deposit, bills of exchange, repurchase agreements. Sol. A budget deficit occurs whenever a government spends more than it makes, which is nearly every year. Budgetary deficit is the difference between all receipts and expenses in both revenue and capital account of the government. Q4. With reference to a cheque which of the following is the ‘drawee bank’ ? Sol. 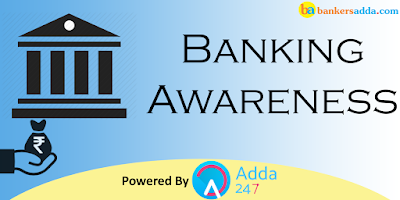 Drawee is a legal and banking term used to describe the party that has been directed by the depositor to pay a certain sum of money to the person presenting the check or draft. A typical example is if you are cashing a paycheck. Q5. Banks issue a letter to beneficiary on behalf of its constituents like guarantee for making payment on their behalf on fulfilment of its terms and conditions. What is this arrangement known in banking context? Q6. ___________ is vested with the responsibility of conducting monetary policy. Sol. Monetary policy refers to the policy of the central bank with regard to the use of monetary instruments under its control to achieve the goals specified in the Act. The Reserve Bank of India (RBI) is vested with the responsibility of conducting monetary policy. This responsibility is explicitly mandated under the Reserve Bank of India Act, 1934. Q7. In which year the Reserve Bank of India (RBI) Act, 1934 was amended to provide a statutory basis for the implementation of the flexible inflation targeting framework? Sol. The primary objective of monetary policy is to maintain price stability while keeping in mind the objective of growth. Price stability is a necessary precondition to sustainable growth. In May 2016, the Reserve Bank of India (RBI) Act, 1934 was amended to provide a statutory basis for the implementation of the flexible inflation targeting framework. Q8. Which scheme/act has enables an expeditious and inexpensive forum to bank customers for resolution of complaints relating to certain services rendered by banks? Sol. The Banking Ombudsman Scheme enables an expeditious and inexpensive forum to bank customers for resolution of complaints relating to certain services rendered by banks. The Banking Ombudsman Scheme is introduced under Section 35 A of the Banking Regulation Act, 1949 by RBI with effect from 1995. Q10. IBA adopts a consultative approach to give its views on any issue pertaining to banking sector. What is the meaning of "I" in IBA? Sol. Indian Banks' Association (IBA) set up in 1946 with 22 members to discuss issues of common interests. Over the years, IBA emerged as the Voice of Indian Banking Industry. Q11. BCSBI was set up to ensure that the common person as a consumer of financial services from the banking Industry is in no way at a disadvantageous position and really gets what he/she has been promised. BCSBI stands for-? Sol. In November 2003, Reserve Bank of India (RBI) constituted the Committee on Procedures and Performance Audit of Public Services under the Chairmanship of Shri S.S.Tarapore (former Deputy Governor) to address the issues relating to availability of adequate banking services to the common person. Therefore, the Committee recommended setting up of the Banking Codes and Standards Board of India (BCSBI). BCSBI was set up to ensure that the common person as a consumer of financial services from the banking Industry is in no way at a disadvantageous position and really gets what he/she has been promised. Q12. When was the currency system in India converted into decimal system? Sol. The Indian currency system was converted into decimal system by Indian Coinage (Amendment) Act 1955 which brought into force from April 01st 1957. Q13. Which of the following field Dalal Street in Mumbai is famous? Sol. The Bombay Stock Exchange (BSE) is located at Dalal Street. Q14. Deposits which can be withdrawn by a customer without notice is called? Sol. A deposit of money that can be withdrawn without prior notice is known as Demand Deposits, Ex:- in a current account. Q15. Which of the following is not e-banking software? Sol. ECS – Electronic Clearing Service. RTGS – Real Time Gross Settlement. NEFT- National Electronics Funds Transfer System. Mobile banking is a service provided by a bank or other financial institution that allows its customers to conduct financial transactions remotely using a mobile. PIPS is not an e-banking software.